The Flight Stakes will always be the one that got away for Miss Fabulass. Remarkably, she finished 0.3L from the winner Oohood but ran fourth. Kerrin McEvoy had Miss Fabulass in a lovely midfield position before the filly starting overracing to the point where she was "nearly clipping heels" according to the hoop. In a decisive move, McEvoy let her slide and very nearly still pinched the race. It was an enormous effort from the horse, and a brilliant ride from McEvoy. The flashing light was Mark Newnham's filly Nakeeta Jane with Punters Intel revealing a last 600m of 33.52s, about a length and a half quicker than the winner Oohood. “Remarkable effort. First prep, very inexperienced horse. 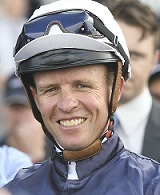 Untapped ability," said her jockey Josh Parr. Many punters will have had eyes for fast finishers Unforgotten, Shillelagh and Mister Sea Wolf watching the replay of the TAB Epsom, however, don't overlook the leader Arbeitsam. Hartnell smashed the Randwick mile track record setting the new mark at 1:32.73, eclipsing Ike's Dream previous benchmark of 1:33.13 in 2004. In margins that's about 2.5 lengths! The track was playing lightning quick all day but the Arbeitsam set a cracking tempo up front running 34.91s for his first 600m. He was only beaten 1.9L at the finish and collared at the 200m. The five-year-old still broke 12s for his last 200m, running 11.96s so was hardly walking late. Shillelagh closed hardest clocking 33.17s for her last 600m, the quickest in the race. Mister Sea Wolf was 33.32s, posting a big 400-200m of 10.70s before peaking on that run slightly late. Unforgotten clocked 33.39s after getting a long way back in the run. She wants 2000m now. There was a reason Hartnell was the 57kg top weight in the TAB Epsom Handicap. He was the classiest horse in the race. However, the win was even a pleasant surprise to trainer James Cummings. “I just really can’t believe it, but you know you have belief in your horse and he’s a super horse Hartnell, he’s just had a great build up to this race, had him here third up, it was a bold move running in the Epsom when he could have run at a WFA and been a strong chance in the Hill Stakes," he said. 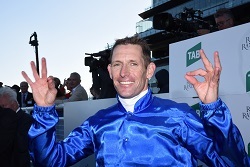 Perhaps the least surprised person on track was Hugh Bowman's wife Christine, with the champion jockey offering an interesting pre-race insight. It was Hartnell's fourth Group One win and Bowman's first for Godolphin. Nature Strip won’t be running in The TAB Everest. The ATC confirmed they exercised a performance clause in the contract after the Darren Weir-trained speedster failed to flatter in the G1 Moir Stakes at Moonee Valley on Friday night. It was an easy decision in the end with the owners of Nature Strip agreeing that missing The TAB Everest was also best for the horse at this stage of his career. The ATC were keeping their cards close to their chest when it comes to who they’ve got their eye on but “three of four” are being considered at this stage. You’d have to think Moir Stakes winner Viddora, Le Romain, Houtzen and maybe even Home Of The Brave, would be in the mix while they’d be keeping an eye on what fellow slot holder Max Whitby does regarding three-year-old Graff. Catch Me was a dominant winner of the G3 Gimcrack Stakes, smashing the race record by nearly half a second. However, the run of the second horse Diddums had just as much merit. The Snitzel filly trained by Clarry Conners showed blistering speed in her trials and was well supported in markets. “That as the question off the trials, when she’s off the bridle is there anything in the tank? There definitely was,” said her jockey Jason Collett. The filly will now spell and aim up at the Magic Millions, the race her dam, Mimi Lebrock, won in 2007.